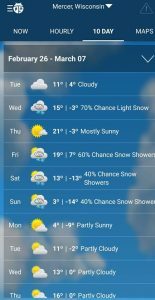 Received 4″ of snow already this week and another 4-8 being forecasted in the next 24 hours (yes, it is snowing right now). Trails are in excellent condition, groomers have been out day and night trying to keep up with the snow and the traffic. We expect another great weekend of riding with a lot of traffic. The base we have combined with the extended forecast should get us riding into March. This is the best the trails have been all year. Ride Safe and Enjoy! This weekend the Great Northern has Dave Steffen Band on Friday and In the Groove Band on Saturday, another fun weekend to be in Mercer at the Great Northern Hotel and Wolf’s Den Bar & Grill. Another 6″ of snow yesterday gives us 10″ in the last couple days. This is the best condition the trails have been in all year and based on the forecast this snow with our base is going to carry us into March with great riding! Now is the time to get in your big trip! This weekend we have DJ Justin Pitlik on Friday night and the Allen Brothers Band on Saturday. Come out and enjoy the party.